New Delhi (IANS): A delegation of young Hindi film actors Ranveer Singh and Alia Bhatt, and filmmakers Karan Johar, Rohit Shetty and Ashwiny Iyer Tiwari met Prime Minister Narendra Modi here on Thursday to discuss how the entertainment industry can contribute to nation building. 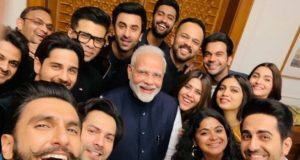 The ‘Prime Minister’s Squad’ — as Shetty put it — also included Ekta Kapoor, Ranbir Kapoor, Varun Dhawan, Sidharth Malhotra, Ayushmann Khurrana, Rajkummar Rao, Vicky Kaushal and Bhumi Pednekar. “Jaadoo ki Jhappi! Joy to meet the Honourable Prime Minister of our great nation,” tweeted the ‘Padmaavat’ star.